I bought this tank to take to Vegas last year when I turned 40- and then promptly put it in my closet and never pulled it out again. However, lately I’m seeing the trend for the fall is animal prints, so I thought I’d give it a go. 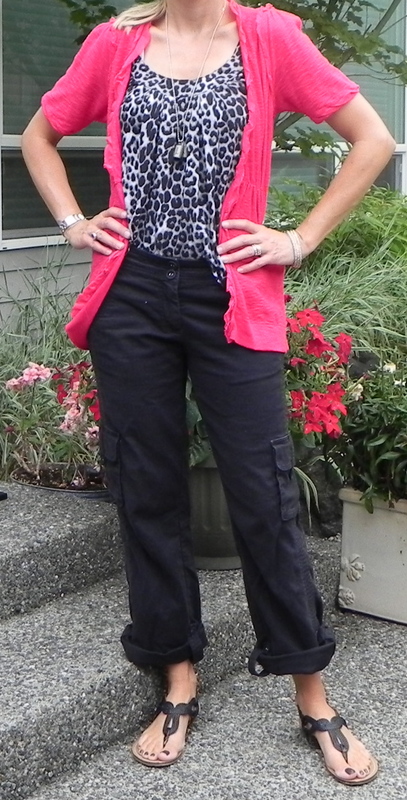 I paired it with a pink short sleeved cardigan with a bit of a ruffle- to sort of play down the edginess of the print. On the bottom I threw on my black cargo’s with a rolled cuff and my ever favorite Target sandals. To accessorize I wore a charm necklace and bracelet.